In Blue Ink: Happy Halloween! My little guy is still too young to really get the whole Halloween thing, and since I'm not really a fan of the holiday I don't see any reason to go crazy with Halloween inspired activities, etc. They are doing a parade and party at his daycare, so we'll see how that goes. He may or may not wear his costume, a hand-me-down Elmo from an older cousin. My family always made a big deal out of every holiday when we were kids, so I would like to make them special for him when he's old enough to notice/care. 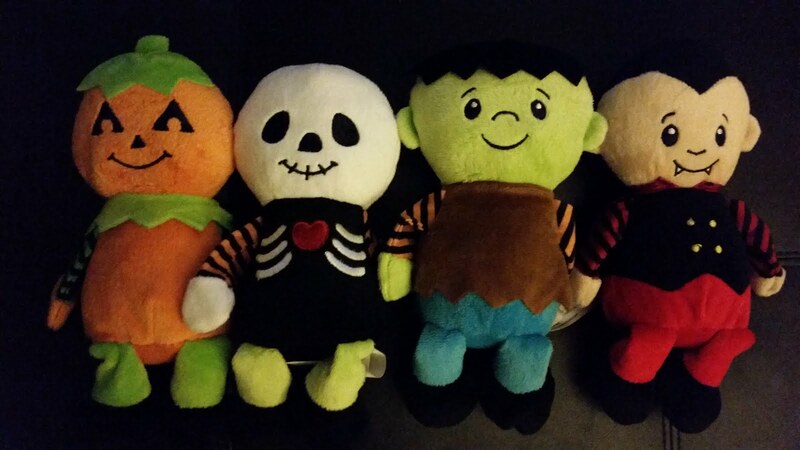 I bought him some little Halloween stuffed guys at the grocery store ($5 a piece spread out over 4 weeks felt like a reasonable expense for holiday fun). He completely ignored the first two (jack o' lantern and skeleton), but when we got home with Frankenstein he gave him some kisses. So even though he's not super interested in them yet, he might be next year!